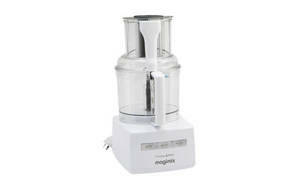 Snapshot: The Magimix 5200XL food processor has 1 speed and a storage box for accessories. How does it rate? Excellent at slicing carrots, grating cheese, kneading pastry (with the processor blade), chopping breadcrumbs and emulsifying mayonnaise. Excellent at making pesto in the mini-processor bowl. Storage box for most accessories, all bowls stored in unit. 3 chute sizes (large chute has a safety locking system). Reasonably stable on bench during operation. Comprehensive instructions with recipes and a recipe app. Comes with 3 different-sized processing bowls. Can jolt when processing a heavy load.